During this fascinating voyage you will visit places where religious, cultural and folkloric celebrations are held by a diversity of ethnical groups that form the continental sized country. We have selected only a small number of special events that take time only one a year and are of great importance to the local population. Some of the places we visit are UNESCO World Cultural Heritage. Additionally you will hike through breathtaking tropical landscapes, national parks, see rainforest and pristine beaches, high sierras with plateaus and table mountains, caverns and waterfalls, big modern cities and charming towns of colonial times. As with all the other tours that we operate: the contrasts are the highlights. Enjoy them! The tour begins in Bahia state with its expressive Afro-Brazilian populations. In Santo Amaro, we will visit the festivities that are performed each year in memory of the abolishment of slavery in Brazil (1888). 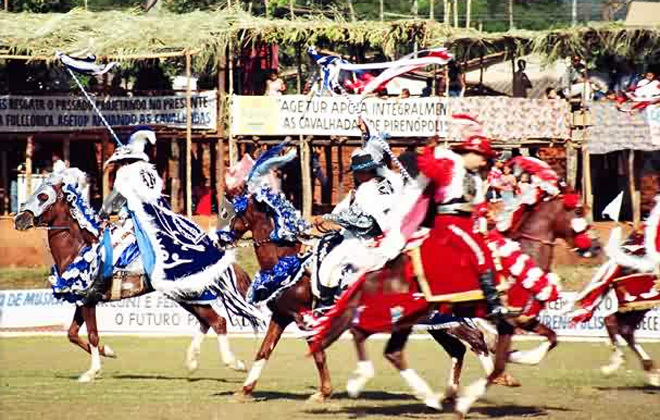 The colorful and dense event Bembé do Mercado, is the most authentic show to present the African cultures in Brazil. Particularly the candomblé cult dances are very impressive. They are performed by small groups who, provoked by constant and very intensive drumming, move in trance to worship the African Gods of their ancestors. Visitors may passively watch these ceremonies but need to stay controlled. Not far from Santo Amaro the historic town of Cachoeira invites for a visit. During the sugar cane boom in the 16th century, Cachoeira became the economic capital of the country. Charming colonial edifications and Brazil's biggest cigar manufacturer will be visited in Cachoeira. 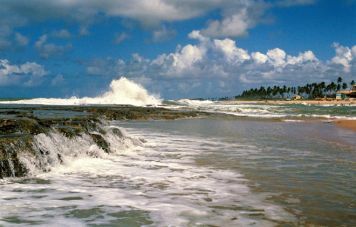 We will be heading now for Salvador de Bahia, the actual capital of Bahia state. 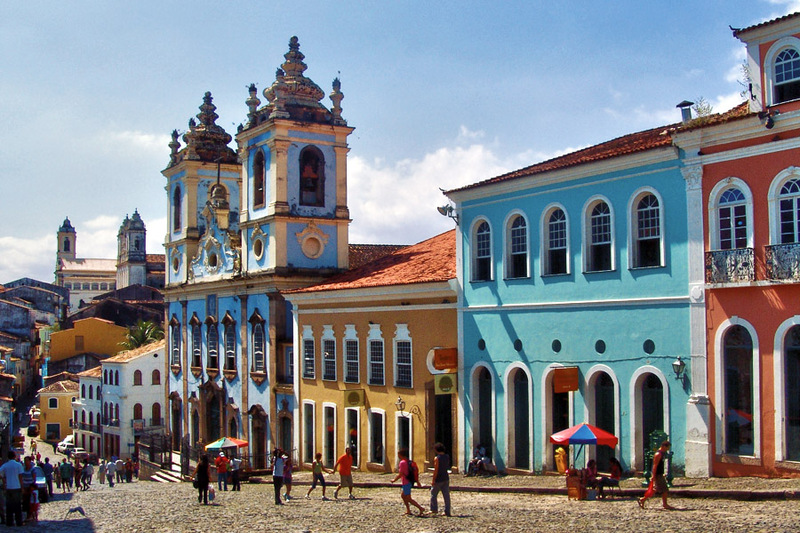 In colonial times the city was the cultural, political and economical capital of Brazil. Even today some 300 churches, fortresses, villas and mansions, testimony of past glory. Most impressive is the Convento de São Francisco, founded 1587 by the Dutch und restored in the XVIII, a monumental work of baroque religious art. 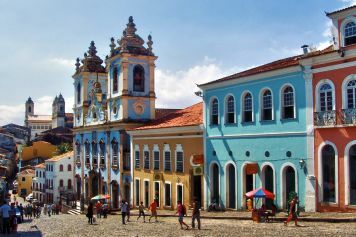 The historic center of Salvador has been declared World Cultural Heritage by UNESCO in 1985. Some 800 residences have been carefully restored around the Pelourinho and invite, together with little bars, cozy restaurants and a great variety of handicraft shops for a walk through picturesque surroundings. We take a night out and watch the performance of world-famous percussion group Blocos Olodum. Nobody stays neutral but everybody gets animated with their stirring drum play. There will be time for a boat ride through Salvadors All of the Saints bay and visits to the beaches northern coast with reminders of a curious hippie population at Arembebe beach and a sea turtle project at Praia do Forte beach. From Salvador a short we fly gets us to landlocked Lençois at Chapada Diamantina highlands. The region played an important role during the Gold and Diamond rush in the 18th century. Lençois maintained its charming colonial character displaying cobble stone streets, small houses, churches and public buildings dating back to more glorious times. Today, the region offers eco tourists a wide array of tours and adventures on the magnificent table land of the National Park Chapada Diamantina. We will walk this paradise to discover its grottos, bizarre rock formations, waterfalls, and springs with crystal clear water for the thirsty. But there are also endemic orchids and bromeliads to find and the fauna is habitat to a great number of birds. Our next destination is Brasília, the capital of Brazil. Here you will not find colonial architecture or other reminiscent of colonial times. 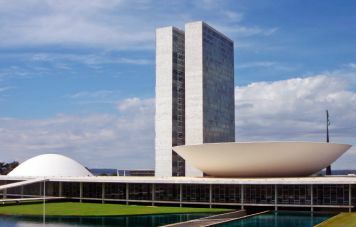 By contrast Brasilía is all modern and even futuristic when you consider that it was projected in 1957 and founded 1960. A landmark in modern architecture, is also the most important urban project of the 20th century, based on which fact, Brasilia has been declared World Cutural Heritage by UNESCO. Pirenópolis, a small town founded in the 18th century, is another cultural highlight on this tour. The city celebrates every year, 50 days after Easter Sunday, during 12 days, festitivites dedicated to the Holy Ghost, that are called Cavalhadas or Cavalcades. A tradition that has been introduced by the Portugiese Jesuits in 1819. The feast begins with the election of the God Emperor, followed by processions, coronation with salves of canons and fireworks. To drive away bad spirits from the homes, masked men sing and play while riding from house to house on colorful decorated horses. The event is highlighted by a 3 days cavalcade during which the cruzades of the middle ages, between Christians and Muslims are being relived. In between the many activities we will visit the States Park of the Serra dos Pireneus whose exuberant nature features some 130 waterfalls, subterranean rivers and rich flora and fauna of the Brazilian Planalto Central (Central High Plains). Our next destination is Foz do Iguaçu on the border to Argentina and Paraguay. Being true to our philosophy of favoring the contrast, we deliver the most spectacular natural wonder that you can imagine: The Iguaçu Falls and the National Park of Iguaçu! The Park is divided in 185,262 ha that belong to Brazil and 67,000 ha belong to Argentina. 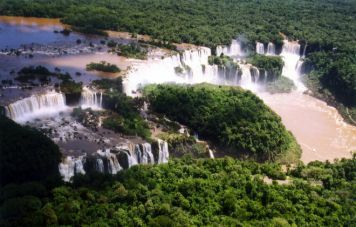 Within his limits are 275 individual falls that originate from the Iguaçu River and with an average of 60 m high, crush down a half circular canyon of 2.7 km extension. An overwhelming explosion of natural power. We suggest a breathtaking rafting trip underneath the falls and a helicopter round trip over the park, the falls, and the meetings of Paraná and Iguaçu rivers, which gives you an impression of the total size and impact of the falls. Despite of superlatives and stereotypes, Rio de Janeiro can be considered one of the world most beautiful and fascinating cities. 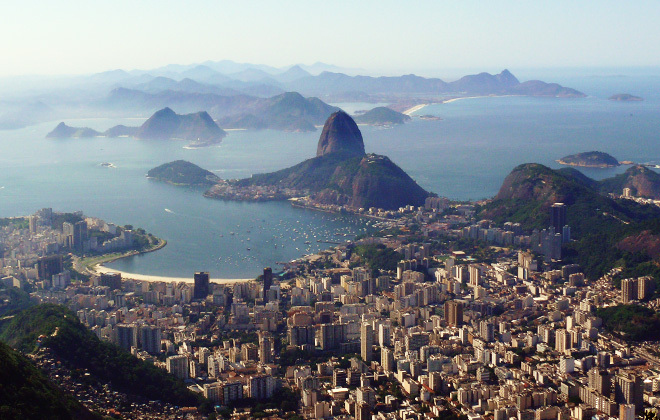 Hosting some 7 million inhabitants Rio is squeezed in between green mountains of the coastal rainforest and tropical beaches at the shores of the Atlantic Ocean. The city essentially shows the lifestyle of a South American metropolis, with a strong touch of tropical laissez-faire. A wide range of scenic, cultural and architectural highlights prove that the city does not strive exclusively on samba and carnival. A visit to the Sugar Loaf, the Corcovado mountain and a bath at the famous beaches of Copacabana and Ipanema is obviously a must. The visitor however should not miss out on a stroll through the historical part of the city. Colorful, loud and busy, the city displays colonial architecture and - in contrast - modern office buildings, banks and business centers. But there are also quite corners and hidden places, where one can relax and meditate, surrounded by the exuberant tropical nature that makes Rio de Janeiro so attractive for visitors and locals alike. A drive in southerly direction, along the shoreline of the Green Coast, takes us to the colonial town of Paraty, an 18th century seaport that played an important role during that period when gold from the mines in Minas Gerais was shipped out from here to homeland Portugal; at that time an important colonial power that reigned Brazil during 4 centuries. The colonial gem is one of the most harmonic architectural ensembles in Brazil and has been named World Heritage by UNESCO. The about 4 hours scenic drive along the coast features great views on islands and little hidden beaches of overwhelming natural beauty. A charming pousada, located in the historic center of the town, awaits you for check-in. You are now to board our schooner for a boat ride between islands and beaches of Paraty. The boat will stop at one of the beautiful beaches where you may enjoy a swim in the crystal clear waters or stroll about the island and marvel of all the lush tropical vegetation around you. 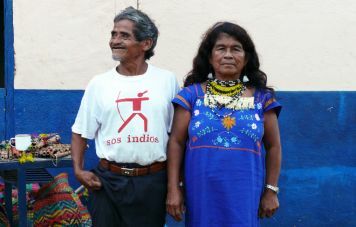 Further on the program is a visit to a nearby settlement of the Guaraní Indian tribe. Discussions with the Chief and members of the council normally proof very interesting and informative and will certainly contribute to enrich the Paraty experience. We recommend a contribution by purchasing their lovely handicraft made from natural fibers and wood. From here it will take a short drive through the Atlantic coastal mountains to get to the dream beach of Trindade. Sitting under a shadowy wild almond tree, right there at the beach and with a special batida poured by Carlos, right on your lips, you may wonder about all the hassle back home or elsewhere in the world. Heading back to Paraty in the afternoon not before paying a visit to one of the notorious sugar cane mills that produce fine cachaça, the Brazilian national drink! 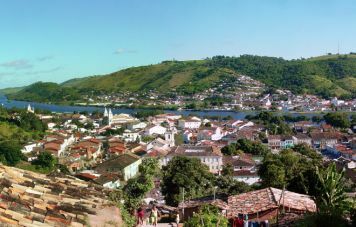 Our guide will take care however that the visit would not take too long, since a walk about the little town of Paraty is still on the list today. 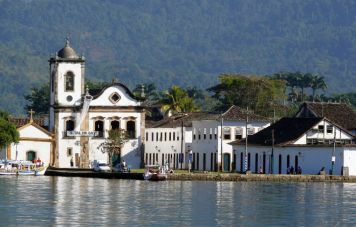 There you will marvel again at colonial mansions and churches that date back to the early 18th century and at elaborated architectural style of that time, contrasting sharply with modern edifications, fortunately not dominating in Paraty. ...a week ago we (6 from Upper Bavaria) arrived back home where it is cold and rainy. Strange enough our mind is not at all focused on Christmas, at least not with me and my wife. Why? Because we stayed the last 2 weeks of November in Brazil and had such a good time there that it is difficult even to write about without sounding exaggerated. Friends to whom we are talking enthusiastically about our trip may think we are wanting to show-off. Anyway, for us 6 and I believe for all the other participants, too, it has been our most wonderful holiday ever and a great experience too. We do not know of any travel brochure that offers the intensity and sustainability with which we were introduced to culture, nature and people. Since there are always changes in the dates of the festivities we can only inform the exact itinerary later in the year. Please also contact us for prices and further details!